OFF: When the system is OFF all relays / contactors are off. 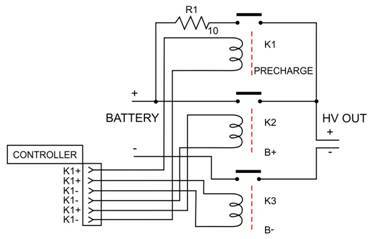 Precharge: When the system is first turned on, K1 and K3 are turned on to precharge the load, until the inrush current has subsided. R1 shows the location of the thermistor in the precharge circuit. ON: After precharge, contactor K2 is turned on (relay K1, must be off to save coil power). For this application note, we will focus on the selection of the thermistor. 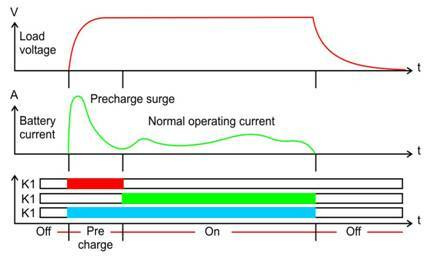 The precharge surge current reaches 63.2% (1/ e) of its initial value after a time τ = RC. In the selection of the thermistor, we consider a time value of “five time-constant” when the capacitances are fully charged and the surge current reaches the normal operating current. R = 5τ / C = 5 (0.02 sec) / 0.05F = 2.0 Ω. At 10°C, the standard part will have a resistance of 5.0 Ω x 1.70 = 8.50 Ω, which will meet our minimum resistance. The steady state current is not calculated, because in most precharge circuits the steady state current goes through the contactor. The part that would meet your specification is AS32 5R020.